How do you know what length to get your new board in? As i have said before just looking to take my surfing up a notch and want to get a shorter board than my 8"6' which has been great to learn in. I have been considering boards such as a 7s Super Fish and a Miller Waterskate types. Basically a board that paddles like a long board but surfs like a short board. But how long does it need to be so that i can stand up easily etc. I am 5 ft 11 and about 75 kg, if that helps. Re: How do you know what length to get your new board in? the hulkster wrote: Basically a board that paddles like a long board but surfs like a short board. Yeah, doesn't everybody. Alas, such a beast doesn't exist. the hulkster wrote: But how long does it need to be so that i can stand up easily etc. I am 5 ft 11 and about 75 kg, if that helps. If you can make the transition from laying down paddling to standing up on a longboard, I don't know that it is going to be that much harder on a shortboard. You could take it 1" at a time until you go from 8'6'' to 6'6'' some 24 boards away, or just take a chunk off. Get a proper shortboard (i.e. with a 6' something at the front) Enjoy the new world you are entering. If at first you find it difficult, well that's surfing. Try harder. Conquer all. Talk also to Grant Miller if he's around. I have been surfing mals for years and went through the same thing about 2 years ago. I got a powerglide, 7'00" as he says, paddles like a 8'6" rides like a 6'6". It's a heap of fun. I still tend to ride the mal on weekends around Sydney but get the powerglide out on trips up the coast and less crowded days. Thats about the nuts of it. I rode a 9'1 Mal for many years and made the same transition. I know ride a 6'6, 19 1/2, 2 1/2 hybrid. Little wider through the middle and less rocker and it paddles pretty bloody good. Not like the mal but hey where talking physics here. The first wave I caught on it was like riding a bar of soap and I spun out at the bottom of the wave. Mind you it was a solid 5' swell. Sink or swim I say. Only took a couple more waves to get the hang of and then a couple more surfs to refine it and then I was blasting. Took to the next level and beyond. Don't sell yourself short - Dive right in. Oh. By the way that board was a custom and I spoke at length to the shaper about my ability and history. They don't call the custom boards for nothing ! Thanks for the info so far, extremely helpful. Am hoping to contact Pridmore for some more info. Much appreciated. I'm 5'10 and 83kg, I've got a 6'8 x 21 x 2 3/4 Miller Waterskate that i used to come down from the 7'10 Mini Mal that learnt on. 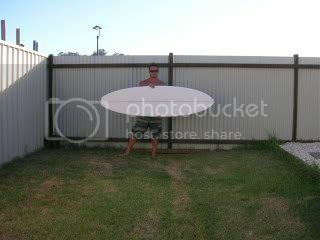 I also have a 7'0 Miller Powerglide which you could have a crack at too. I've had 5 over on it before, which might appeal to you after being on a longer board. I live at Cronulla so if you're anywhere between Narrabeen and Wollongong, let me know and we can meet up for a surf so you can take it for a test drive. It's almost impossible to get your hands on a Miller Demo so if you're looking to buy one of his boards i'd be happy to let you surf mine for a little while to help you pick what dimensions suit you. If i was you at 75kg i'd be going for a 6'6 waterskate. Might sound a bit short, but you'll be surprised how quickly you'll want to go shorter once you get the hang of it. Either way, Grant's a champion and won't bumsteer you, so you can put your faith in him, but either way, it's nice to try before you buy.... Wish i could've done that before i bought a few of my boards. 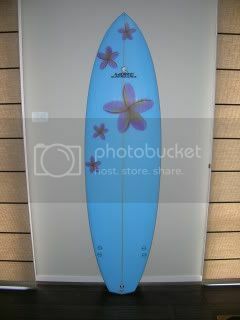 I've also got a PCC (Paterson Contempory Craft - local Cronulla shaper) 6'7 x 20 1/2 x 2 3/4, which you could try out aswell. I'm sort of going in the opposite direction to you. I started on shortboards and mine have been getting progressively longer, thicker and wider ever since! Having said that, I reckon the 6'6" to 6'8" length is around about the sweet spot for versatility in a short board. Provided you get enough width and volume in the board that would be fine. If you wanted to be a bit more conservative you could go to a 6'10" or 7' but I don't think that'd be necessary. But DO keep your longer board for the 1' days. So, I'd suggest an eggy or fuller volume board around 6'6" to 6'8" around 19.5" to 21" wide, about 2.5" thick with fuller rails. Some people might say to go 2 3/8" thick and that might suit you as you get more comfortable on the shorter board but for the moment 2.5" would be fine. Pridmore would be good, or Miller or Geoff McCoy or others who tend to specialise in higher volume boards, and they'd fix the right dimensions for you. Just note McCoy likes his boards a little more boaty than most, so you may need to peg him back an eighth of an inch here or there. I'm not game to weigh myself at the moment, but my normal realistic fighting weight is around 85kg. I can go lower but I need to work at it. At that weight I like a board around 6'6" and 2 5/8", with around 19.5 - 20" in width. Unfortunately I'm carrying a bit more weight so a 2.75" beast with around those dimensions is just "ok". I'm actually getting a Miller Powerglide to aide the weight reduction transition, in the sense I get a board that floats me better when I'm fat! At least I'll still enjoy surfing when fat, which means I'll do more of it, which means I'll lose weight more quickly. Odd logic, but it works.